Azé is an association of general interest governed by the 1901 French law and is managed by three volunteers: Sonia Perrin, Director, Claire Bordron, Treasurer, and Alizée de Pioger, Project Assistant. The association Azé was born from my encounter with Father Pierre Tollard, Augustinian of the Assumption missionary who was stationed in the great south of Madagascar for more than fifty years. I was then looking for a place to supervise the studies of two teenagers born in the Efiaimbelo family, a family of sculptors specialized in creating Aloalos, Funerary Sculptures honoring the deceased Mahafaly. Father Pierre, with his distinctive optimism and enthusiasm, responded immediately and favorably to my request. Particularly aware of the problem of deprived children from the most disadvantaged families, Father Pierre created in 1989 the association AMIKA (laic association following Malagasy law, recognized to be of public utility, and certified by the Ministry of Education Malagasy). AMIKA’s mission is to fight against exclusion, stigmatization and abuse of orphaned and vulnerable children in Madagascar. 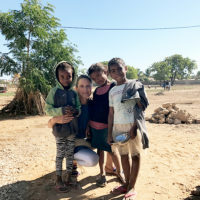 Father Pierre has succeeded in financing the purchase of land as well as the construction of three school buildings in the center of Toliara, Madagascar, where children can attend elementary school. AMIKA pays for enrollment fees and schooling costs of over 200 high school students enrolled in some of the best high schools, and technical highs schools of the city. The support of each child is subjected to a neighborhood review and is submitted to a council of teachers. In order to give a chance to the greatest number of families, no more than two children per family are supported by the association. Teachers follow the official “teaching by objective” approach (PPO) which is enriched by courses in ethics and hygiene. Now retired, Father Pierre entrusted me with the mission of ensuring the continuity of his work alongside Father Marco Joachim Roseta, Malagasy Augustinian of the Assumption, former student of the Catholic University of Paris, administrator of the elementary school Saint-Nicolas, and today Director of AMIKA. Malagasy employees, laic teachers, and supervisors work together as a team to ensure the school follow-up of over five hundred young people, their access to one meal per day along with preventive care and health education. Struck by the extreme poverty of the region and with the aim of raising funds to finance the numerous needs on the ground, I created the French association Azé. I am absolutely convinced that education is a fundamental stage of development. I am absolutely convinced that education is a fundamental stage of development. Education empowers people to develop personally, to become independent and responsibly active within society and I hope you will join me in supporting younger generations to embrace their future. our children of Toliara flourish. the right to live and develop, the right to an identity, the right to healthcare, the right to education.